I recently bought a boatload of old 1960s-1970s Gold Key horror/mystery comic book scans from this guy’s online store, and have been plowing through them. It’s been a lot of childhood nostalgia, as well as a lot of memory-poking of old stories and the actual old comic books I’ve got boxed up & totally unorganized (perhaps a summer project might be going through them all & fixing that). The actual copies of these things are pretty tough to find and aren’t too cheap, so the digitized deal is quite the good one, if you enjoy this sort of crap. 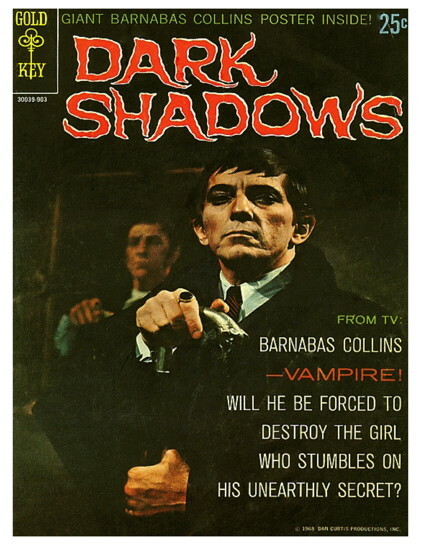 I started out reading the complete run of the Dark Shadows series, all 35 of ’em. I have one actual issue of the thing, bought by my mom since we were both fans of the actual show at the time, and it disappointed both of us. And in reading the rest, the reasons for that disappointment so many years ago still stand – while the Gold Key DS series reproduces a few of the characters from the show & utilizes vampire/werewolf/witchcraft plotlines, it doesn’t have the tone of the show at all. The art is also poor – the only character who looks like her TV counterpart is Joan Bennett’s Elizabeth. Barnabas the vampire is the main character & hero of the thing, but Julia’s role from the TV show is reduced to nothing, and Angelique only turns up a few times to torment him as a ghost. And they don’t look anything like Grayson Hall and Lara Parker, nor does Barnabas look like Jonathan Frid. Later comic book versions of the thing I perused on Amazon are far truer to the look & feel of the 1966 TV series, and anything beats the forced campiness of the Tim Burton movie. I trudged through them, a couple of the stories weren’t too bad, but overall, weak tea. Then I started on two different comics I had a few issues of back in the day – The Twilight Zone and Ripley’s True Ghost Stories. Both of these titles began in the early 1960s and ended around 1980 or so. The T-Zones have a wider range of stories, from offbeat scifi to eerie revenge tales, similar to the TV show. A comic Rod Serling serves as narrator, and while the art is generic, there are clear attempts by the artists to crib the look of some characters from familiar faces of TV actors who you’d expect to turn up on the show. While many of the stories are formulaic and hit a real dead spot in the mid 1970s before recovering somewhat before the title ended, a lot of them are pretty good. Much like the show, you can categorize the stories into various sub-genres: someone changes identity (either via clothes, bodies, faces, masks, etc) and things go right or more often wrong; someone gets wishes granted and things go wrong; someone enters the past/alternate dimension/reality and must escape;weird unreal stuff happens to someone ordinary and then we find out we’re not in an ordinary world, a la “Eye of the Beholder,” etc. The Ripley’s stories are all along similar lines – someone in the present or the past comes across some place that’s haunted, some local or creepy caretaker tells them the sad story of some wrongful death that resulted in the ghost, and they either GTFO or find a way to put the spirit to rest. The best of these are either the creepiest, such as one tale of a voodoo shaman with a sugar cane harvesting zombie army who try to dig their way back into their own graves, or ones where the “believe it or not” aspect is most likely true – like the story of two graverobbers who accidentally revive the “corpse” whose jewels they try to steal – a young woman who then returns home after being mistaken for dead and several years later gives birth to Sir Walter Scott.